This happened TODAY WHILE WE WERE FLYING !! we had to land in a hurry; remove the rest of the cars that were parked close to that van and we used all the extinguisher from the cars; had to call the fire department ! Can you figure what happened ?? Oh, wow! That is horrible! Poor guy. WOW... Sad, yet people keep charging their batteries in their cars. So much for a couple of $$$'s worth of extension cord. Uh oh !! iminent crash ahead !! I had a almost crash today with my easy glider !!! threw it vertically and it climbed as always !! like a space shuttle !! when i reached the desired height ..... WAIT A MINUTE, I HAVE NO CONTROL !!!! THE PLANE WAS FALLING DOWN doing all crazy manouvers, it speed up, slow down, spiralled nose first etc .... my friends had their hands on their heads anticipating the disaster. Suddenly when i was 50m nose diving into the ground i regained control and was able to do a gentle turn and took it off of the steep dive and certain death of my glider .... leveled and landed the way it was pointing. It should not be a big deal to solder it back on. A similar thing happened to my Super Cub last week. The antenna had gotten wedged under a servo arm. I had it up in the air, and it just didn't feel right. I had control, but there seemed to be a slight pause in reaction time. As I was bringing it in, it winged over. I was able to right it momentarily before it happening again. It hit nose first, but a surprising small amount of damage was done. It did ruin my 2200 mah battery, though. Even if you fix the antenna, you shouldn't trust it again with your nicer planes. Once you re-solder an antenna wire it looses a bit of range. If the wire is pulled out at the receiver board end then I respectfully disagree. What is your reasoning for reduced range? Also it would be VERY easy to replace the stock antenna with a skew planar antenna for an even better setup with MORE range. 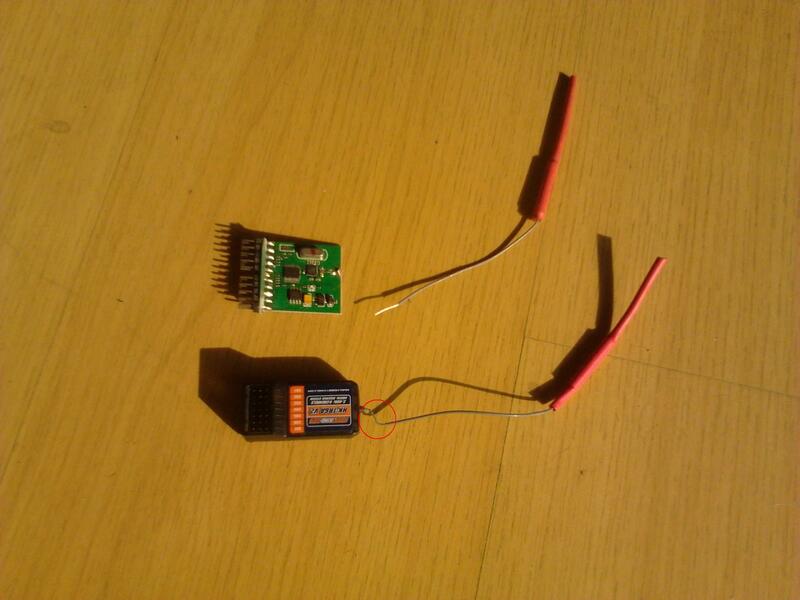 I have seen other receivers with a re-soldered antenna that are reduced in range and reliability... I'm not saying it can't be done, just that you shouldn't trust an expensive plane to the fixed Rx. Thinking along those lines, do we trust an "expensive" plane to a $9 receiver at all? Hey, I fly on the Turnigy $9 receivers as well. I have a Futaba Radio in addition to my Turnigy but only one Futaba Receiver. The others for the Futaba are , Orange, FrSky and a Corona (All FASST compatible) Which together just about equal the One Futaba receiver in price. Show me a pic of where the wire broke. It is not difficult to make an entire new antenna from a piece of coax if necessary. An old wireless router can provide the necessary components usually. Short antennas, like you find on Spektrum gear, are active along their length, so if you break them they're stuffed because the antenna length is out of step with the radio wave. you can see the broken antenna from the HK and a completed severed from the 9X receiver. can i get the 2 repaired ? if not i would gladly use the 9X "spare" antenna to fix the HK. a lil bit confused on what to do ..... also that wire is very thin ... didnt had a closer look yet; maybe today after work. They can both be repaired without any loss in range or reliability. You'll need a sharp tip on your iron, and to work quickly. If you open the 6ch rx, you'll see how the shielding of the coax is soldered to a separate pad to the core. You need to expose enough of the shielding to bunch it up and solder it on to the outer pad, while core is soldered to the little pad further in. If you look closely, like with all coax, there's an insulating layer between the core and the shield. You have to work fast with your iron so you don't burn this off, and also so you don't stuff the board of the rx. If you've got the equipment and fine motor skills to solder it up, give it a shot as you have nothing to lose. Re-solder it put some CA/glue on it and do some range check. Als wiggle the antenna wire arround a couple times while moving your controll surfaces so you can see if it loses signal or not. I personally would not trust this but for a few weeks it should be ok! Looks like I got back to the party late. Just to reinforce what has already been said. No problem, completely repairable in this case. 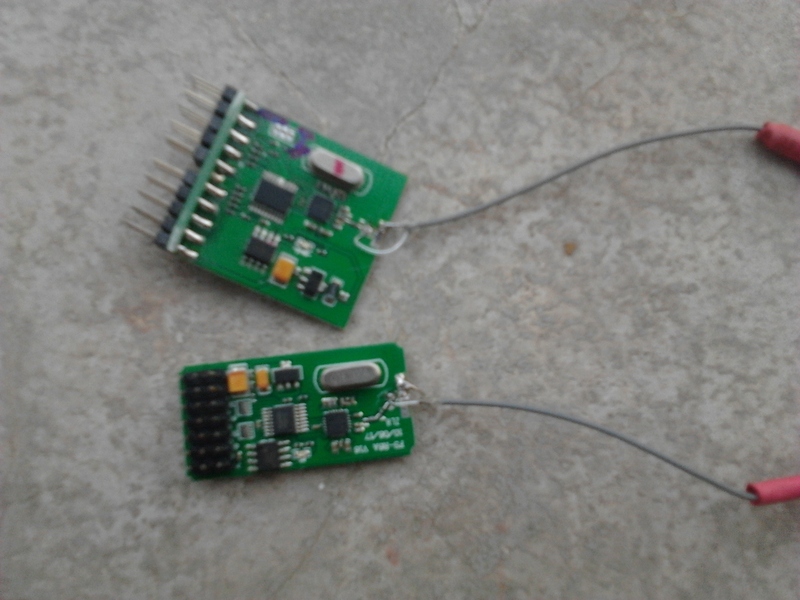 Got home and attacked the receivers, with the tips i got from you guys was easy to solder the wire ends. again, thank you guys (lobstermash) for the tip on soldering the coaxial wire.